And have we! Four times since then, to be exact. So often that you could say this has become one of our specialties. When we make it for ourselves, we usually have plenty of leftovers for dinner the next day. It’s also great to make when visitors are here, as it’s quick to prepare and the volume can be increased by adding more veggies. It takes so little time to make and consume that it took me five or six times to get a photo of it! This kind of dish is great because not only can you easily make more or less curry, the recipe can also be adjusted based on your dietary preferences. The only truly essential ingredients are the green curry paste and coconut milk — they’re what makes it “green curry,” after all. The veggies are up to you, and feel free to leave out the chicken (we always prepare it separately anyway). Thus far, we have served the curry over rice, which absorbs the sauce beautifully, though you could also make it more of a soup by using rice noodles. Now to the recipes: I’ve separated the curry and chicken recipes for ease of reading — I hope you can figure out the rice on your own. Two Years Ago: Edible Radish Greens?! If you’re making rice, get that going before you start on the curry as it will take the longest to cook. You can cook the curry and chicken at the same time, so dice up the chicken now, too. Chop all the veggies before you start cooking. Once the veggies are ready, heat your wok and add a small amount of oil. When the oil is hot, throw in the onions, garlic, and ginger, and cook until they are translucent. Take them out and set aside. Next, put the peppers, zucchini, and snap peas in the wok. Stir a few times, then put the lid on and let them steam for a 3-5 minutes, stirring periodically. When they are tender-crisp, remove them from the pan (you can put them with the onions) and set aside. Now, put the curry paste in the empty wok and fry it for less than a minute, then add the coconut milk and stir while it heats and the paste dissolves. Add the lime juice. 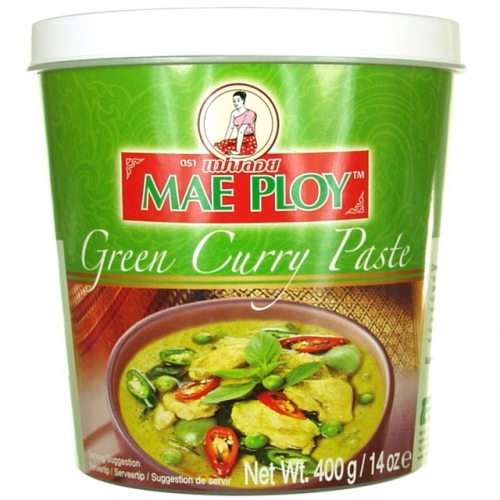 If it’s too spicy, add more coconut milk; if not spicy enough, add more curry paste. Once the broth is smooth, add the bok choi, green onions, and cilantro and cook for a few minutes until they wilt (alternately, you could flash-fry them after you do the zucchini mixture and before preparing the broth). 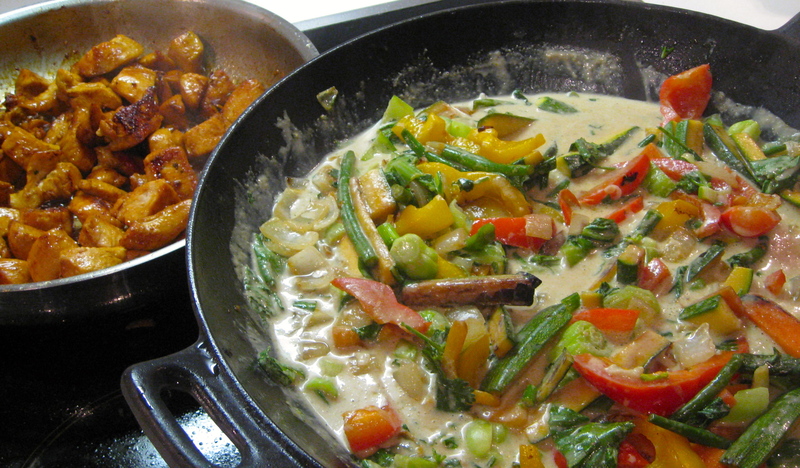 Add the cooked veggies back to the wok and let everything simmer for a few minutes before serving. Before you start cooking the curry, make sure you dice the chicken and put a big frying pan on the stove to heat up to medium-high. When the pan is hot, add some oil and sauté the chicken in batches — try to do this at the same time as you’re cooking the curry vegetables. If you’ve had to cook the chicken in multiple batches, add it all back to the pan in the end and toss it with sesame oil and soy sauce (to your taste), then let it finish cooking while you finish the curry. Serve the curry over rice (I prefer brown) with the chicken on the side. This entry was posted in community, food, full meals, health, pictures, recipes, travel on 20.04.2013 by taplatt.